Sweet Marjoram Essential Oil (Origanum majorana) is also commonly known as Knotted Marjoram and Pot Marjoram. Sweet Marjoram Essential Oil has a medium-strength herbaceous, warm, spicy aroma presenting a middle fragrance note. We added Sweet Marjoram Essential Oil to the Rocky Mountain Oils Relief and Wellness collections. Use the oil in a diffuser, aroma inhaler, or topically to promote relaxation and support a restful night’s sleep. Blend Sweet Marjoram Essential Oil with a carrier oil and mix with bath water for a wonderfully relaxing foot soak. Use only light pressure with upward strokes, and no pressure on the downward strokes. No known safety considerations. Apply with a carrier oil for topical application. I love this oil it smells so good ..all of the oils I have bought at Rocky Mountain oil have been reasonably priced and very high quality. I ordered this oil to diffuse. Upon receiving it, I opened the bottle and put a drop in my hand. I put hand up to my nose and inhaled. I could not believe how uplifted I felt. I love Rosemary and diffuse it every night when I go to bed. I decided to add the Sweet Marjoram and Lavender H to the diffuser. It was heavenly. I put a few drops in my body lotion; very refreshing. I am sold. This sweet marjoram essential oil is amazing!! It totally helped me relax and sleepð??? The smell of the oil is just like it says sweet. I would highly recommend this oil for others to purchase! Love to mix with lavender at bedtime! This helps me sleep and is relaxing!! IT is saving my life. IT is saving my life. . .LITERALLY!! This oil is top quality and purity. I feel very secure knowing RMOs are the best. I have been concerned before that cheaper oils were not everything they were claimed to be. Shipping was free, and ordering was very easy. I will continue to use RMOs. I especially like the fact that they are direct to customer, with no membership or fees. Thank you, RMO! At first, I thought it was okay. But as I continue using it, I'm falling in love with the scent. I mix it with lavender and peppermint and it's smells so soft and sweet-herby. I love Rocky Mountian Oils. I love Rocky Mountian Oils. They provide a quality product every time. I use their Breath Ease oil almost every night! My purchases are always shipped quickly and packed well! Thank you for providing such wonderful oils! I love the earthy smell of this oil. I diffuse it in my chiropractic practice. It has a very calming effect and blends well with other oils. I really like ordering from this company. The oils are great and priced right plus the shipping is very fast. I especially like their sturdy shipping boxes and they don't use those annoying shipping peanuts. I will order from them again soon. I LOVE RMO! The products are high quality & less expensive than competitors. I love the free shipping too!! Wish I had ordered the 15ml instead of 5ml, I liked it so much I already ran out. I ordered number of oils -- 8 in all -- and when they arrived one of them had leaked. All it would have taken was a last minute check that all caps were secure before packaging. Just what I expected from RMO! 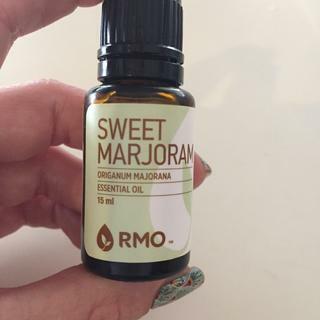 The quality of RMO's Sweet Marjoram is just what they say it is - top quality. Everything I've ordered from RMO has been excellent and I know I'm getting the best. Thanks, RMO! I would like to return this oil. It does not smell right like it should. Did it get rosemary mixed in by accident? Bought this for a blend, but I’m not sure if I’ll be using it since it smells a bit like a weak oregano oil. One of my very favorites. Such a lovely smell. Perfect to add to all my blends with a house full of children. I'm used to a very high quality sweet marjoram, and this comes very close. Great quality for the price! I love Sweet Marjoram oil. I use it nearly every day. I ran out and ordered another bottle and was disappointed with the bottle I received. It didn't smell like my other bottles. It had a back-end smell like it had been in manure. It was so bad I couldn't use it and am afraid of ordering another one for fear of that same bad smell.